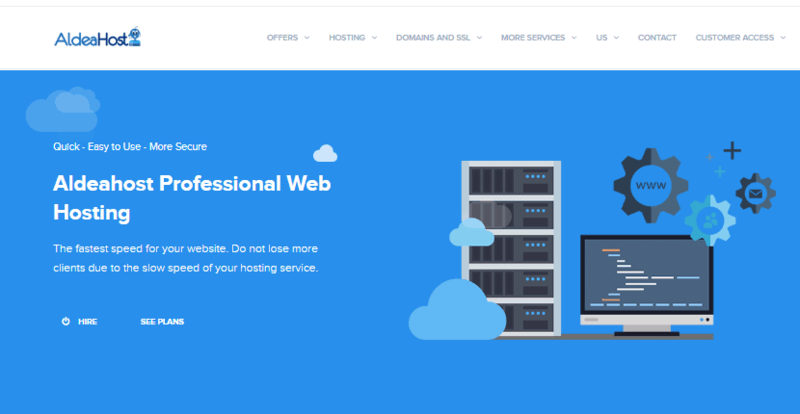 Aldeahost Review 2019: Is Aldeahost a Good Hosting? AldeaHost is a Mexican web hosting service that provides a variety of shared, business, VPS, and WordPress hosting along with domain registration and web design services at pocket-friendly prices. Founded in 2009, Mexican web hosting company AldeaHost comprises a small team of about a dozen staff who pride themselves on their “heroic technical support,” fast server speeds, and innovativeness. Their range of services includes various shared hosting packages and virtual servers, as well as value-added services such as web design and content creation. While they don’t own any of their own data centers, they’ve partnered with four well-established data centers in the United States and the Netherlands to serve their 2000+ strong customer base. AldeaHost offers stable hosting packages with 99.5% hardware and network uptime. With five plans under shared hosting, AldeaHost gives you options that can fit your budget. Let’s look briefly at their popular shared packages. Smart Hosting Only – With 350MB disk space and 3.5GB monthly bandwidth suitable for hosting a single website, this plan is good for anyone who’s building a personal blog or small e-commerce store. Solo Hosting Mini – Suitable for small businesses, this plan comes with 1GB disk space, 7GB monthly bandwidth, and unlimited emails. Basic Hosting Only – This package is ideal for designers and can host up to two websites. It comes with 10GB disk space, unlimited emails, and 100GB monthly bandwidth. Pro Hosting Only – With 100GB disk space, this plan can host an unlimited number of database-driven websites with up to 500GB monthly traffic. AldeaHost also has two more shared hosting plans in this range, which would suit someone maintaining four websites and six websites respectively. When you sign up for any of their plans, you get a one-click app installer with over 200 applications, a website builder, and free auto SSL. Unfortunately, none of their plans include a free domain registration. AldeaHost promises an uptime of 99.5% every month; if your website is down for just one hour in any given month, they’ll will reward you with 2 weeks of hosting free for each hour that your website was inaccessible. Moving up, you can also order high-performance VPS with HDD storage, which will be hosted in an American data center. These are fully-managed VPS plans that are easy to upgrade and come with multiple configurations. You can scale up your VPS to match your resource needs and install any apps without restrictions. Their operating system of choice is CentOS, and they’ve included cPanel and WHM for free as part of the package. Commercial hosting is also available to customers who want to set up e-commerce websites with integrated shopping carts. Alternatively, if you’re planning on using WordPress for your website, they’ve also got specially-optimized servers for that very purpose. You can choose from three plans – WordPress Smart, WordPress Mini, and Basic WordPress – all of which include SSD storage, good RAM, and powerful processors that can ramp up the speed of your website. AldeaHost gives you a number of well-priced pre-made hosting packages as well as customizable virtual servers. I found their shared hosting packages priced very fairly, but their VPS packages were on the pricier side; moreover, their billing terms tend to differ from plan to plan (shared hosting is billed either annually or monthly, while VPS hosting is billed quarterly). When checking out, you have a number of payment options such as PayPal, bank transfer, and MercadoPago Card. Your hosting account will become active the moment you authorize payment. From there, shared hosting customers have 30 days in which to evaluate the service – should they be dissatisfied for any reason, they can request for a refund under AldeaHost’s money back guarantee. Behind their super fast and flawless hosting service is a friendly technical support team that takes care of the nuts and bolts of servers on-site so that your website and apps can run smoothly 24 hours a day. Unfortunately, beyond that, I didn’t find their customer support as heroic as they claim to be: their live chat is only available during Mexican business hours, as are their telephone operators and ticket support system. Further, customer support is only available in Spanish at this point, so foreign customers may find the service inaccessible. You can also check their FAQs and knowledge base for answers, but these are entirely in Spanish as well. Mexico-based AldeaHost definitely has affordability and server speeds on their side. However, it’s very likely that in order to expand much more than this, they’ll need to ramp up their customer support and increase the affordability of their more enterprise-grade plans. Wondering how Aldeahost stacks up against other Web Hosting companies? Enter any other Web Hosting company and we will give you a side-by-side comparison.